We have put together a range of personalised presents and gifts. as well as Wedding and Christening gifts. Coast range of beautiful limed wooden boxes, photo frames and key-cupboards. 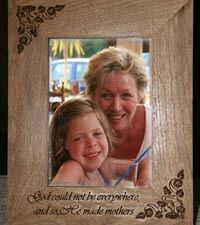 All can be personalised with words and images of your choice. The boxes make lovely memories or treasure boxes. 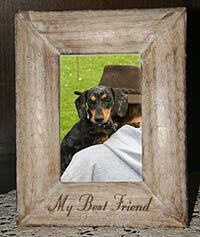 Partner with a photo frame for a wonderful personal gift. These oak frames are sturdy and beautifully made. 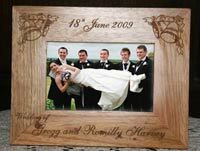 We can engrave words & images onto the frame. It can be engraved lightly for a subtle effect or deeper for a darker colour. If you have a preference let us know. There are hundreds of images to choose from - the words are your own. Lots of fonts available too. Create the perfect gift. Classic top quality engraved brass or modern anodised aluminium on a solid wood bar. You choose the font, the layout and even an image if you want.